I made this as a request from a friend of mine for her to give a friend of hers who got engaged on Valentines Day. I used a blank white 5 x 7 inch card inside which I computer generated a printed "Congratulations". I covered the base card with red Bazzill. I cut a piece of light yellow plain card just a bit smaller than the base layer and embossed it using the Cuttlebug Swiss Dots folder. 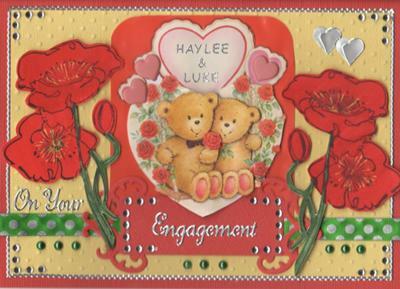 I positioned the base layer of a Valentines Day 3D sheet by Le Suh in the centre of the yellow layer and then built up all the layers of the the 3D picture using 1mm mount blocks, including 3 pink brads to cover pink hearts in the picture. I then cut a Spellbinders ornate label out of red Bazzil and positioned that over some green and silver spotted ribbon across the bottom of the card. I used some silver peel off alphabet stickers to spell out the recipients' names and a silver engagement greeting. I stamped a Stampit 'poppies' stamp in black Stazon ink once on a scrap of white card and using a 'mirror' stamp I also stamped it facing the opposite way on more scrap card. I then coloured both poppy stamps in with Tombow markers, cut both of them out and mounted them with 1mm mounts on either side of the 3D picture. The card was then finished off with some Kaisercraft green pearls and silver rhinestone strips in the corners. A simple narrow border of silver stickers was applied and a double silver heart sticker was added to fill the top right corner. I have been making cards for more than 10 years and get lots of requests for my handmade creations from family, friends and even complete strangers! I love using 3D images and generally try to incorporate them in all my work.